Eat at Mom's Rectangle Platter, by Certified International. 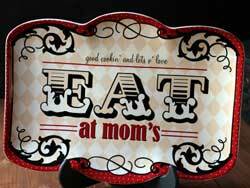 A charming collection in a striking red and black color palette, Eat at Mom's features family-centered messages in vintage-style lettering. This is for the Rectangle Platter. 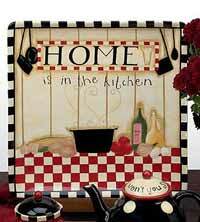 Reads: Good cookin' and lots o' love, Eat at mom's. 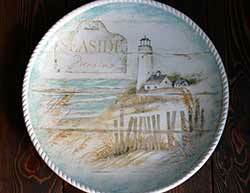 Measures 16 x 11.25 inches. Designed by Simon & Kabuki. Microwave and dishwasher safe. 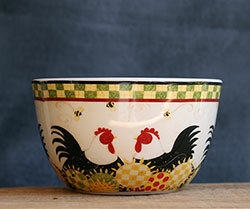 Family Table Prep Bowl, by Certified International. 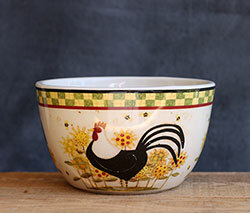 Featuring the whimsical artwork of Dan DiPaolo, this bowl is painted in black and cream/white polka dots. 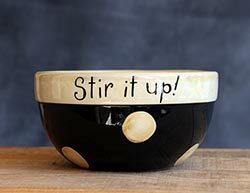 "Stir it up" along the rim. 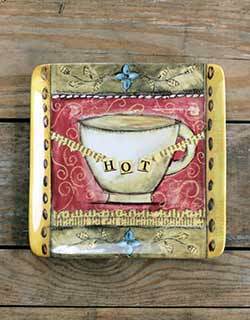 Features the whimsical, coffee-themed, mixed media artwork of Lisa Kaus! Features hand-painted artwork of a country snowman wearing a colorful scarf, laden with multi-colored wrapped presents! Vintage Snowman Dinnerware, by Certified International. 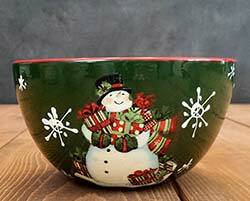 Vintage Snowman Dinnerware features hand-painted artwork of a country snowman wearing a colorful scarf, laden with multi-colored wrapped presents! Accented with holly leaves and berries, pine boughs, and snowflakes. Background is a rich hunter green, with a cranberry red rim. 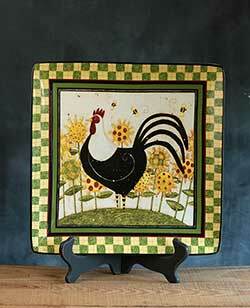 Artwork by Susan Winget. This is for the Salt & Pepper Shaker Set. Stands 3.75 & 5 inches tall. 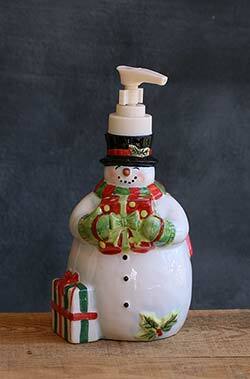 Vintage Snowman Dispenser, by Certified International. Vintage Snowman Dinnerware features hand-painted artwork of a country snowman wearing a colorful scarf, laden with multi-colored wrapped presents! 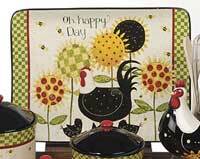 Winter Fun Dinnerware, by Certified International. 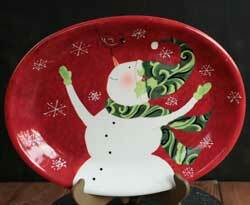 Features the beautiful snowman and santa folk artwork by Susan Winget, in a red, green, and white color palette. 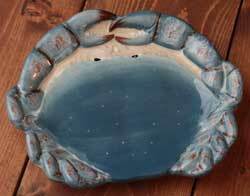 This is for the SNOWMAN ICE CREAM BOWL. Sold individually from four different snowman poses - Choose the top left, top right, bottom left, or bottom right bowl. Measures 5.5 x 3 inches. Microwave and dishwasher safe. 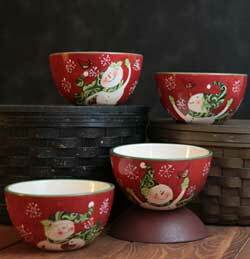 Winter Fun Dinnerware, by Certified International. 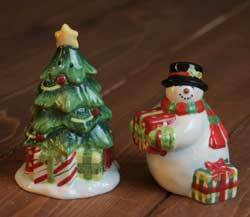 Features the beautiful snowman and santa folk artwork by Susan Winget, in a red, green, and white color palette. 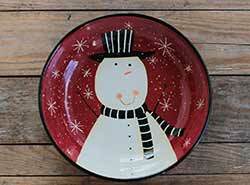 This is for the SNOWMAN OVAL PLATTER. Measures 15.75 x 11.75 inches.